On the 4th of June, Arizonian rock and roll outfit The Maine will drop their highly anticipated fourth studio album, Forever Halloween. In light of the upcoming release, I recently got the chance to speak with drummer and founding member Pat Kirch about the album, their songwriting and recording process, and growing up with their fans. Pat also shared a pretty crazy tour story with us, check out the interview below! Hi there! First off, can you introduce yourself and tell us your role in the band? Hi, my name is Pat and I play drums in The Maine. So, Forever Halloween is set to drop on the 4th. Is there anything on the record that you think will surprise fans? How do you think Forever Halloween compares to your previous releases? I think the album has more of a human feel than any other album we have done in the past. You can feel the energy and the connection between five people playing in a room together. I would say that is the biggest difference between our past albums; this time we learned about a different way of recording that will change the way we do things from now on. What’re some of the lyrical themes behind the album? That is probably a better questions for John [O’Callaghan, singer], and I do not want to speak on his behalf. But to me, what I love most about John’s writing on this album is that it comes from a very personal place. Some songs are written in a more straight-forward way, where you can really tell that it is a story that happened, which I really enjoy. Regarding the music, what are some things you guys experimented with? We experimented with a bunch of different sounds on this album as far as guitar/drums/ and bass tones go. I think sonically there is more of a mood than anything we have ever recorded and I think that is because of some of the tones we used. We ended up making a pretty straight forward rock album and just did what we do best, which is drums, bass, two guitars, vocals, and maybe a little bit of piano here and there. I think we made a recorded that is pretty rounded, which I am really proud of. What was the songwriting process like for this album? Has it differed from how you’ve written previous albums? It was kind of the same way we have gone about the past albums besides maybe Black and White but John usually comes in with an idea for a song, we get in a room and work it out as The Maine. It is pretty simple and we just do what works for us, we all add in our own flavor on top of what is really John’s vision for a song. What would you say were your biggest inspirations when writing this album? Our musical tastes are always growing and changing so I do not think we could really pin point any specific artists but just rock music in general was an inspiration. Listening to albums that are not recorded to be perfect but to have a feel and a vibe, that is what we took inspiration from. You recorded Forever Halloween on analog tape instead of digitally, what was that experience like and what brought about that decision? It was an amazing experience, it brought us back to how it felt to record the first album in the sense that we didn’t know how the recording process worked and did not understand how things were go to go down. That is a really scary thing but it is exciting and brings something different out of you. You just kind of have to let go a little which lets you make more on the spot decisions. For me I have become so comfortable with how modern digital recording works that there isn’t any fear or worry about how the process will unfold. With recording this album live it was like starting over and learning a whole new craft which is really exciting and thats when the best stuff happens. Do you have any personal favorites off of the new record? Can you tell us a bit about them? I change my mind on this question each time I am asked it but right now I am going to go with a song called Blood Red this song goes from being a mess to all coming together and then does that all over again. It has tons of ups and downs and a lot of what we used on the song was kind of done in anger/a joke after a late night and it captured a mood that we could not have forced. I am very excited for people to hear thats song! You guys has come a long way from Stay Up, Get Down, how do you feel your band has progressed and evolved since your formation? The word I would use would consistent, we have continued to evolve with each year and each release. It has just been slow and steady and it all just goes along with we are getting older along with our fans. On separate note, what are some bands/artists that you’re currently listening to? I have been listening to a lot of Weatherbox, Pavement, The Replacements. 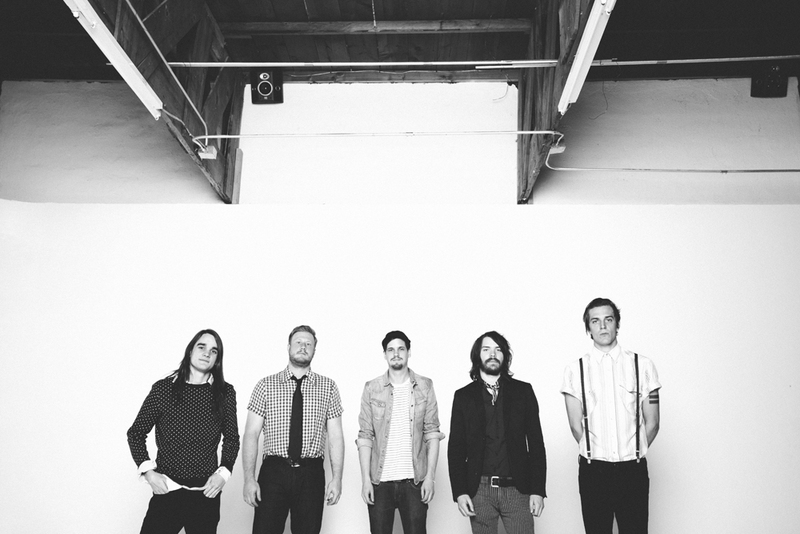 You’re set to embark on tour with Brighten, A Rocket To The Moon and This Century this summer. What’re somethings you’re excited for about it? Everything!! We will be with our best friends and playing some new music along with old music. It is going to be a great time. Since we’re on the topic of tours, can you share a tour story with us? A few months ago we were driving through Texas and a car coming the other way on the freeway flipped over into our lane and kid flew out of the back of the car. The kid landed on his feet and didn’t have a scratch on his body. We were able to stop in time and did not hit the car but we all got out of the van to help the people in the car and John was kind of shaken up by seeing the car flip over and the kid fly out that he passed out. It was a pretty crazy day to say the least. That is insane. Thanks for taking the time to talk with us! Any last words? Thank you!! Very excited for people to hear Forever Halloween on June 4th. You can pre-order Forever Halloween from The Maine’s website, and download their new track Love and Drugs by clicking here.